In 2008, Pennsylvania was the center of the tree house building world. There were 3 fantastic tree houses built at Longwood Gardens, where we installed siding on the tree house designed after an Norwegian Cathedral. The Tyler Arboretum also had a large tree house art exhibit. All in all, the main line was buzzing all year with tree houses everywhere. 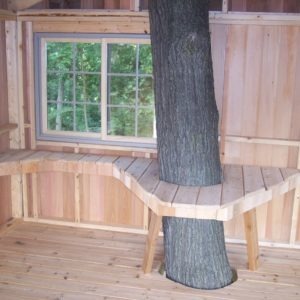 At the end of that summer, we built this fantastic tree house for three lucky kids in Bryn Mawr to play in and around. It has a zip line outside and a hidden storage compartment inside. It is built in 2 strong red oaks. This tree house shows off some beautiful tongue & groove cedar siding and tempered glass railings. 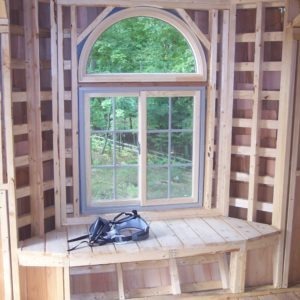 The bay window adds some complexity to the exterior appearance and makes the interior feel much larger. We love the look of cedar shakes like these on our tree houses. The tree house has a very sharp, polished look to it. While treehouse costs vary greatly and each project is unique, we understand your need to have some idea what each project in our portfolio would cost to build. Please see our tree house pricing page for a description of the factors that go into each quote. This tree house as shown would cost between $40000 and $55000. Please feel free to contact us to discuss whether your project would fall on the high end or low end of this range.